Tones Garlic & Herb Seasoning (Ajo Y Hierbas) has No MSG Added and No Salt Added. 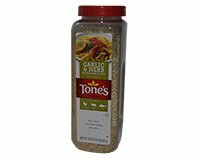 Premium Salt-free Blend, Tones Garlic and Herb Seasoning is a delicious salt-free blend of herbs, and garlic to flavor beef, chicken, fish, or seafood while sauteing, roasting, or grilling. Ingredients: Dehydrated Garlic, Spices, Dehydrated Onion, Orange Peel, Paprika (Color), Red Pepper. Garlic & Herb Dipping Oil More Recipes..